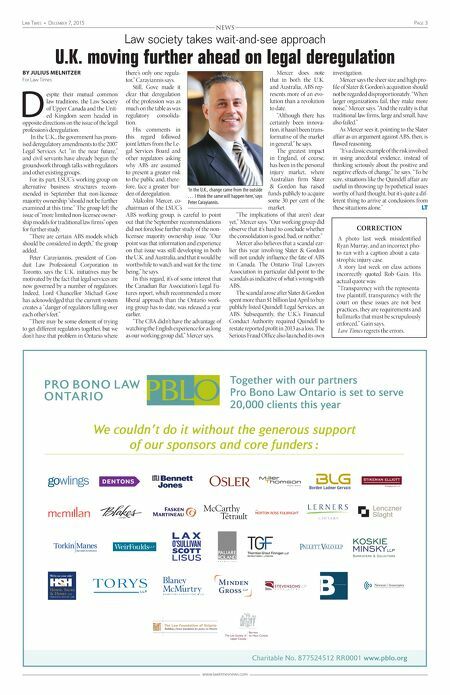 Page 2 December 7, 2015 • Law Times www.lawtimesnews.com NEWS Lawyers say Perell ruling aimed at copycat lawsuits Class action firms expect increase in carriage fights BY NEIL ETIENNE Law Times ow that an Ontario Su- perior Court of Justice ruling has put up firmer barriers to questionable class action fee arrangements among plaintiff counsel, the question now is how will firms with such arrangements proceed and what is the potential fallout. Some lawyers say it could mean more battles for carriage and others say, more frankly, that things could get nasty. In his late November ruling in Bancroft-Snell v. Visa Canada Corporation, Superior Court Justice Paul Perell pointed to what he said could possibly be an "illegal" fee-sharing agreement created by MLG when ruling it was unenforceable, and ordered the firm not to be compensated. Perell said that not only did he find the agreement potentially illegal because it would have had class members in On- tario "pay a ran- som fee in order to stay late-arriving rival class actions in Alberta and S a s k a t c h e w a n " but it did not serve the best interests of the class members and under- mines the integrity of the class action regime. "The court has signalled that it will not approve fees payable to law firms who do not con- tribute to the prosecution of an action in a meaningful way. In other words, class counsel can no longer pay law firms to go away because they commenced a copycat action in a far-f lung province at the eleventh hour," says Jay Strosberg, partner at Sutts Strosberg LLP. "Unfor- tunately, litigation may result among law firms who currently have these arrangements in place and ultimately the court will need to determine whether these are bona fide consortium agreements. This could get ugly." If a fee is disallowed, a firm may commence an action and seek the fee that was contractu- ally agreed upon. "The facts of each case will drive the result," he adds. "For example, if a law firm is lead counsel in Quebec, and there is a national settlement, there is nothing wrong with allocating fees to that law firm and I sus- pect that a court will not have a problem with the arrangement among counsel. There may be a problem if a law firm files in multiple jurisdictions, does no work, and then class counsel agrees to pay that law firm to secure their agreement to sign a settlement agreement. "It will be interesting to see how these situations play out," Strosberg says. In the case that involves inter- change fees paid by merchants who accepted payment by Visa or MasterCard credit cards, Per- ell approved settlements, con- tingency fee agreements, and a class counsel fee of $3,384,571, but he ruled a fee-sharing agree- ment crafted between MLG and Camp Fiorante Matthews Mo- german was unenforceable and ordered Camp not to pay any sums from the settlement pro- ceeds or from any other source, ever, "on account of the unau- thorized and possibly illegal" fee-sharing agreement to MLG. Actions were launched in five provinces and, in August of 2014, class counsel, led by lawyers from Camp Fiorante- and the late-coming Merchant Law Group, attended a judicial dispute resolution conference that resolved an im- passe for carriage in Alberta and Saskatchewan, af- ter MLG agreed to stay its rival proposed class ac- tions. Under that agreement, class counsel from Camp Fiorante as- sumed the respon- sibility and cost of obtaining stays and they agreed to indemnify MLG for any costs claims in the stayed Alberta and Saskatchewan actions. University of Windsor asso- ciate law professor Jasminka Ka- lajdzic says because these types of arrangements have been commonplace and now found unenforceable, it will change class litigation in the country. "The judge [Perell] went even further to make his point by rul- ing Merchant will not get paid; that really does bind the plain- tiff counsel's hands," she says. "It means you cannot bargain away any carriage case by offering a portion of the fees." Kalajdzic says the ruling could lead to more carriage bat- tles at court and the potential for more co-counsel arrangements. "But there has to be good will between counsel to do that [co-counsel arrangements]," she says. "I think it will mean more carriage battles for Merchant." She adds that the ruling warns that counsel must be forthcoming with their agree- ments as judges will likely now probe deeper into the class cases and fee arrangements. "I think with this ruling, the call for greater disclosure and transparency has been heard," Kalajdzic says. Koskie Minsky LLP associ- ate Robert Gain says that while he could not speculate on much of the potential results from the ruling, "our firm is prepared to work with co-counsel who are able to add value to the class members and to share fees ac- cordingly. "We will not include a firm as part of a consortium which does not have sufficient resources to make meaningful [contribu- tions]. It is a privilege to repre- sent a class," he says. Gain says firms shouldn't be permitted by the courts to insert themselves into a case simply as a means to extract a payment to stand down. "We will fight for carriage in those circumstanc- es," he says. MLG did not return requests for comment by press time. LT STAY CONNECTED TO YOUR LEGAL NETWORK 2015-16 Atlantic Legal Telephone Directory connects you to your legal community providing accurate and essential legal contact information in all four Canadian Atlantic Provinces. Compiled by the respected legal directories group at Thomson Reuters, you can rely on a directory that grows and expands with your legal community. Each year find new and updated names, mailing addresses, email addresses and phone numbers for lawyers and law offices. Also get quick, easy access to: % Law and Barristers' Societies % Courts of Appeal % Federal Court of Canada % Government of Canada departments % Judicial districts and judicial officials % Incorporated Municipalities % Land registration and information services % The Associations of Land Surveyors % Law Foundation % Provincial government departments % Boards and Commissions % Law Related Services, Institutions and Organizations % University law faculties ... and much more. New Edition 1FSGFDUCPVOEȕ+VOF ȕ- Multiple copy discounts available *Plus applicable taxes and shipping & handling (Prices subject to change without notice) Stay connected with the 2015-16 Atlantic Legal Telephone Directory. Order your copy today. 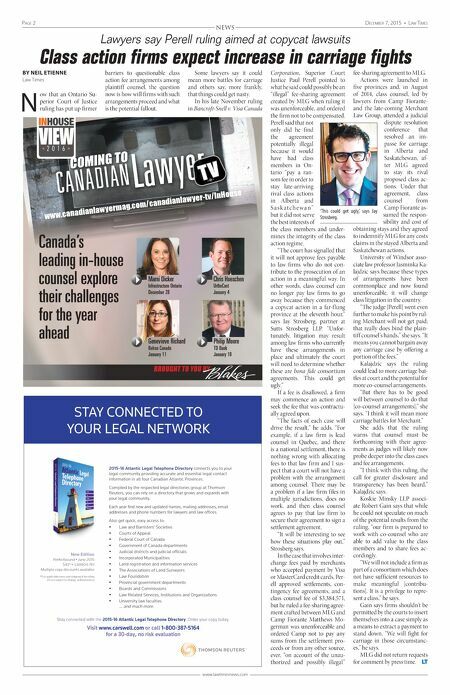 Visit www.carswell.com or call 1-800-387-5164 for a 30-day, no risk evaluation Untitled-1 1 2015-11-24 3:48 PM COMING TO www.canadianlawyermag.com/canadianlawyer-tv/InHouse Canada's leading in-house counsel explore their challenges for the year ahead BROUGHT TO YOU BY 2 0 1 6 VIEW Chris Hoeschen UrtheCast January 4 Philip Moore TD Bank January 18 Marni Dicker Infrastructure Ontario December 28 Genevieve Richard Belron Canada January 11 Untitled-3 1 2015-12-02 2:39 PM N 'This could get ugly,' says Jay Strosberg.